At the time of my earlier blog post we had just handed in our work. Nothing like this had been done before, so what would follow was a mystery for everyone. Click here to review our proposal “Haaganpuro” in more detail and click here to download it for yourself (only available in Finnish unfortunately). Fast forward a few months and I’m happy to say that our proposal has now been published on the City Planning Department’s website and open to comments from the public. We’re very excited to see our ideas being presented on par with the official proposals and the City Planning Department deserves a big thank you for this. However, at the same time it must also be noted that our proposal didn’t entirely get the same treatment as the official ones. It did get shown to residents in the development project’s first public consultation event and apparently it also got looked at by the Department’s internal review group. But the intensity and seriousness of the look was is in all likelihood lighter than with the rest. Whereas the architecture firms have been in dialogue with the Department since the review, we only got our feedback last week. Nonetheless, in late April we also got invited to present our work at the Department’s Pikku Huopalahti seminar where the architecture firms revealed their final proposals to all stakeholders (except residents) of the development project. That was the first time we saw the other plans whereas we decided to make ours public already months ago. The three architecture firms are AJAK Architects, helsinkizurich, and Serum Architects. As said, all four proposals can now be reviewed and commented online until June 6 and afterwards the city will draw its conclusions and lay down principles for drafting a detailed plan. The principles should get published in the fall. The final analysis of the impact and role of our intervention can naturally only be made after the city’s detailed plan is drafted and ultimately gets political approval. Still, in the meanwhile, I have three observations and thoughts I’d like to bring up for discussion. Firstly, I find it alarming how wide the gap between the Strategic Urban Planning Division (yleiskaavaosasto in Finnish) and the Town Planning Division (asemakaavaosasto) is within the City Planning Department. Physically they work on different floors of the same building, but they might as well be on different planets. The strategic urban planners have been working on a new city plan for a good while now and really no one can have missed the future course of the city to seek ways to make Helsinki more urban. Key elements of this project include expanding the inner city further out and to transform the main arteries leading into the city into urban boulevards. And it just so happens that Pikku Huopalahti generally and this site in particular both lie next to one of those arteries and are right at the edge of the inner city. Moreover, the development we’re talking about will even take place on a practically empty piece of land. In other words, this piece of land is screaming for the kind of development that would support those future trends. Realizing something different would certainly be a blow below the belt for the introduction of the kind of vibrant urban areas the strategic planners are envisioning. But the town planners feel differently. From the get go, they’ve directly and indirectly communicated parameters (e.g. number of new residents & density) the architecture firms and we should follow to end up with acceptable proposals. Despite rhetoric about expanding the inner city and being open-minded, those were the kind that support building more suburban city fabric – or semi-urban at best. Low densities and a lot of cars. This attitude is best illustrated through the official feedback the city gave us. 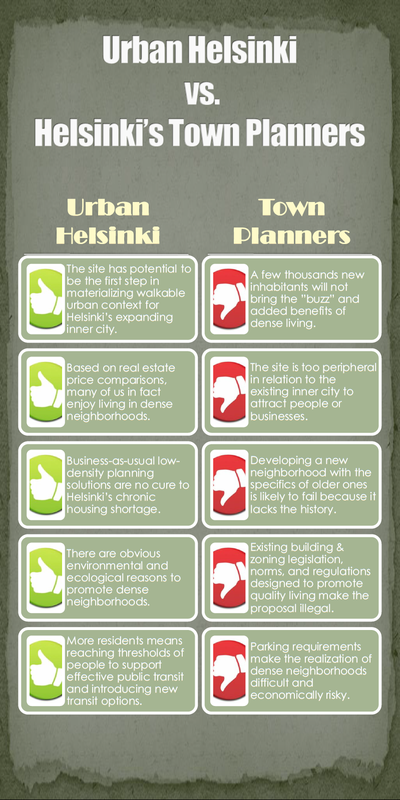 Comparing our arguments against those from the Town Planning Division shows more than anything that the town planners have a difficult time linking the Pikku Huopalahti site to the wider context of Helsinki’s development. Secondly, the gap between the mentalities of the two planner groups also leads to further imbalances. As it stands, the town planners follow the teachings of the modernist “neighborhood unit school” which seeks to create leafy and low-density suburbs. This has been the dominant ideology for building cities for decades (and still largely is) and the City Planning Department was actually created in the first place during the emergence of this planning model. This approach to planning is also grounded on a strong belief in unity and the valuing of social equity which has led to a belief that we all want and are happy with the same living conditions designed to provide healthy and high quality living for everyone. Real life has however proven that this certainly is not the case. Some of us want to live in urban areas, some in the suburbs and some in the countryside. And some somewhere in between. This of course is common sense that everyone knows, but in recent years the idea has slowly come to the attention of public authorities too. Thanks to recent empirical studies on the subject this thought now has scientific support and can be dealt with officially. The strategic planners are the most visible group to have taken these thoughts seriously while they are working on the new city plan. It however is problematic if the folks at the town planning division only have the passion and know-how to zone for suburban urban fabric. Since it is all the more clear now that the city officially recognizes that not all areas need to cater for just one median lifestyle, could the town planners also be organized accordingly? What I mean is that planners who have the passion to create areas for urban lifestyles and neighborhoods would be in charge of them and the ones interested in suburban areas would stick to catering for them? Urban development is a profession where “one-size fits all” is never a good idea. Locals reviewing the draft proposals back in the fall of 2013. Photo courtesy of KSV. Finally, the third point I want to highlight is that even if Pikku Huopalahti’s planning process is not over yet, there are signs that our planning activism is making a difference. According to our voices on the streets, our Haaganpuro proposal has been able to shift the discussions about the development project towards a more urban direction. We’ve been told that at the public consultation event some months ago the preliminary proposals of the architecture firms had a very suburban character and for example had more stand-alone residential towers than urban blocks. Our proposal was the same already then and suggested to introduce more than twice as many new residents than the others and reflected an urban character similar to the way the inner city is built. We received supportive feedback from the public and surprise, surprise, when the plans were officially published last month they had taken a turn towards a more urban approach. Of course it’s impossible to say if this is only thanks to our agenda and efforts for promoting better urbanism. Most likely it’s not. But nonetheless, even if it’s difficult to evaluate the extent we’ve influenced different stakeholders it is certain that our entry has shaken the business-as-usual way of doing things within the City Planning Department. The true value of our proposal is that it has forced planners as well as the private consultants to reflect their thinking against ours and check the validity of their arguments for creating great cities. With that being said, whether you’re in Finland or elsewhere in the world, I warmly encourage you to get active with the development of your city or neighborhood. You don’t need to be an “official stakeholder” to make a difference. Thanks for a nice blog and this interesting project. I’m analyzing this case in a study project and would like to ask you, how did Urban Helsinki get involved with the Pikku Huopalahti planning project at the first place? Did you contact City Planning Department and ask for a chance to submit your own plan to the process, or how did it happen? Thanks Pilvi! 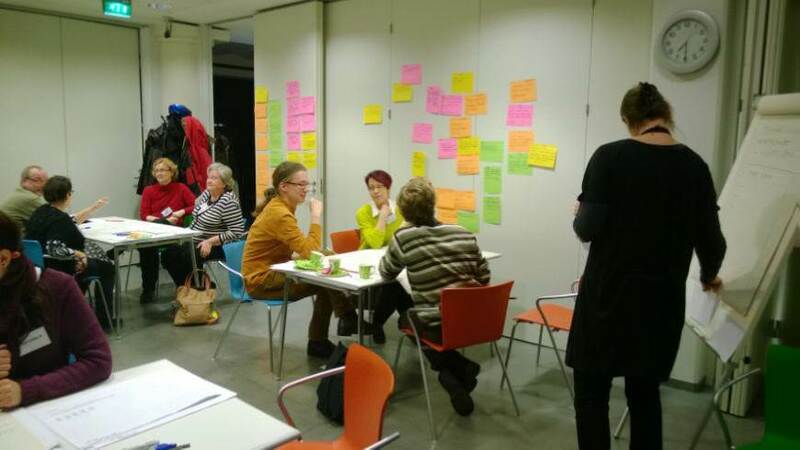 Our project was preceded by some people from the “Lisää kaupunkia Helsinkiin” Facebook group working on a crowdsourced alternative plan for the area around Koskela’s hospital premises. One of these guys later on became a member of Urban Helsinki. Partly inspired by the Koskela project (I suppose), the Head of Helsinki’s Masterplanning Division mentioned the possibility of doing more YIMBY stuff for Pikku Huopalahti when the Koskela-engaged member of our team asked him about contemporary projects where a new intervention could be possible at that time. This happened at the pre-Christmas party for Lisää kaupunkia Helsinkiin. Later on that night we founded Urban Helsinki by forming a group of people who would take on this idea. From there on we just more or less informed the planner responsible for the detailed planning of the area that we’re going to do an alternative plan and got tipped by the Head of the Masterplanning Division. She then got us in touch with the consultant managing the idea competition (representing the landowner) to send us all of the background materials the other consulting offices invited for to compete got. They had no problem with us submitting our plan so we got the materials and started to work. Thanks Timo for answering so quickly! This clarifies very well the starting points for this project. My study is related to a course called Planning theory and urban studies in Aalto university. Maybe I can ask you later some more questions if needed? Oh course! See the ‘contact me’ section for contacts.